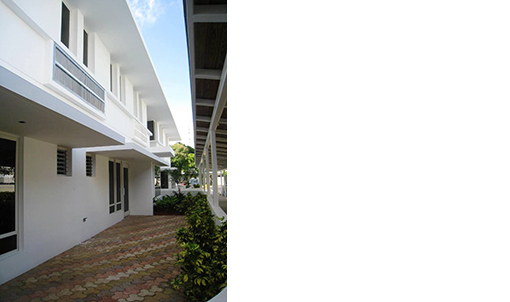 Founded in 1902, Robinson School is one of the oldest and most prominent English schools in all of San Juan. It is located on 4.5 cuerdas of land in the middle of El Condado. It is virtually a green park in the middle of a medium to high-density residential area. Although the school has a generous property and its physical facilities are in generally good condition, a need for an overall evaluation of space-usage, academic organization and planning efficiency arose among the community. The general purpose of the Master Plan was to give a vision of the school's future and map out its development over a long-term time span. Photo by Aerial Architectural Photography, Inc. The work was organized in three phases. Phase I included a historical research of the physical development of the school, serving to the creation of diagrammatic base plans and a building inventory. Phase II planned several development alternatives for the buildings and site, as well as an evaluation of the existing spaces in relation to possible enrollment growth. Phase III involved the preparation and implementation of the final Guide Plan. Even though Robinson School had a pre-shool program, existing conditions were not adecuate to sustain the children’s and parents’ necessities. All the classrooms were spread accross campus, some housed within the existing structures and some in temporary sheds. The only viable alternative was to consolidate all the pre-school spaces in a single structure, designed exclusively for pre-chool education.